The profusion of jasmine climbing our fence inspired me to fill a few vases with clippings to bring indoors. Its potent scent is a clear reminder of spring, especially on rainy days when its sweetness infuses the fresh clean air. This photograph was taken in the morning when sunshine was beginning to filter through the clouds after a storm. 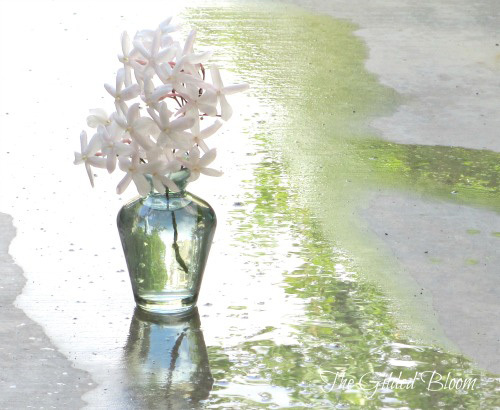 The glistening light of the wet cement frames the vase in this image and highlights the flowers.